Sixth grade students belted out a tune while ignoring crumpled and forgotten M&M wrappers on their desks. The scene could lead one to wonder, "This is math class?" For Marylin Leinenbach, pairing candy and songs with numbers is a way to make learning math a little sweeter for Rockville Elementary School students. Leinenbach, an Indiana State University associate professor of elementary education, began working with two elementary and two middle school teachers in August at the request of Rockville Superintendent Randy Kerkhoff. Parke and Vermillion school districts had applied for a grant that would have implemented a program to improve students' math skills. But after the grant request was denied, Kerkhoff turned to ISU for help. "The concern was students passing the End of Course Assessment for Algebra I," he said, noting the success rates for Indiana students is not high. "If we could strengthen the skills of students in the earlier grades, then it has the potential of giving the students stronger skills in math." Kerkhoff said there was another important component of the collaboration. "It also gave Rockville Community Schools a partnership with a major university," he said. "This is important to the school system for the future of our students is dependent on how well we all educate our students." Leinenbach and the four Rockville teachers worked to develop lessons and activities. "We all worked together on different strategies on what one can do to teach children math," Leinenbach explained. Fifth grade teacher John Batty studied under Leinenbach when he attended ISU and is one of the four teachers. "It was one of my favorite classes I took at ISU," he said. "I was really excited when I heard Dr. Kerkhoff partnered with ISU and she would be coming here." One day each month, Leinenbach drives north to Rockville where she spends an entire day working with the students, co-teaching with the Rockville teachers. One month she works with the middle school, while the next month she works with the elementary. "By partnering with ISU, it opens different pathways to teach students math," Batty said. "It's very beneficial because not all kids learn the same way." Returning to the classroom has been a joy to Leinenbach, who spent decades teaching in the public schools. "What Rockville has given me is validation of my almost 10 years of study of the ways children learn. Children can learn by giving them the opportunities to show, to set in motion their unique gifts," she jotted on the back of a receipt - the only paper she could find in her excitement after her first day teaching at Rockville. "All children not only have the right to learn, they can learn." As part of working with Rockville teachers and students, Leinenbach guided them through a multiple intelligence survey that helps show how students learn best such as musically, spatially or linguistically among others. The survey results surprised sixth grade teacher Doyne Cruse. He discovered many of his students learn kinesthetically and musically. Now, he brings the lessons to his classes differently. "We have many hands-on activities," Cruse said. "We do as many activities as we can through music and movement." "It doesn't matter what abilities they have it's up to us teachers to show strategies that allow the children to show us they understand," Leinenbach said. That is why she goes to Rockville carrying tubs of materials and leads songs such as "Old MacDonald Had a Polygon Barn" that tells of different shapes and "If You Want to Multiply By Nine," which teaches multiples of nine to the tune of "If You're Happy and You Know It." On a recent Tuesday, Leinenbach brought graphic calculators and passed out individual-size bags of M&Ms. "Do not eat them," she warned. "We need them for data." 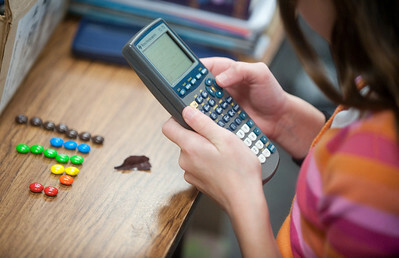 The students learned to create graphs on the calculators showing the number of brown, red and green M&Ms in each individual-size bag. Silence filled the room except for soft clicks as the students entered data into the calculators. As they finished, hands punched into the air so they could show Leinenbach and Cruse their results. Finally, when each student finished, Leinenbach spoke the words which the students had been waiting to hear. "Ok, now you can eat the M&Ms," she said, resulting in students chattering while M&Ms quickly disappeared from their desks. "We've had so much fun," Cruse said with a smile. "The kids love it." 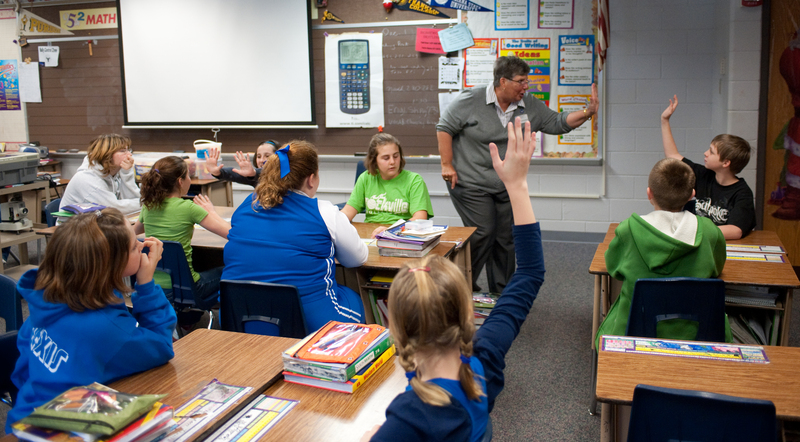 Marylin Leinenbach, an Indiana State University associate professor of elementary education, began working with Rockville elementary and two middle school teachers on math lessons and activities.